Apps are an important component at events, e.g. for increasing the engagement of the attendees, for networking or to have fast and comfortable information on demand. As diverse as the event itself, so diverse are the areas of application of event apps. Many attendees would certainly rather forget their ticket to the event than their mobile phone at home. We are digital and the mobile phone has become a constant companion. Why not rely on the digital medium App and give information to the attendees in a convenient and compact way. 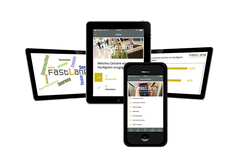 Event planners benefit from the flexibility of an app. If the program has already been printed or the information has already been compiled, it is not uncommon for changes to be made. Then it's time: Everything from the beginning! That doesn't happen with an app. Changes can also be made at the event at any time. This saves costs, personnel and time. 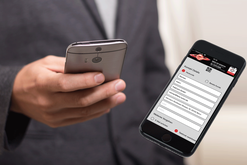 With our B2B-Lead App you collect all your contacts conveniently with your own mobile device. By scanning the QR code on the name tag of your conversation partner, the contact data stored there is transferred to the app. The data from your app account is sent to you via an Excel list for quick and easy entry into your CRM system. This allows you to offer your exhibitors a special added value and thus achieve a higher return on your event costs. Equip the entire team with information on demand? With CrewNavi you can manage all event-specific content such as schedules, organizational matters, etc. on your smartphone and share it with all event teams. Learn more about CrewNavi here!